The BLUSTREAM ISBT21 For use with the PXAMG Automotive Media GateWay. This device is designed to plug into the GateWay (uPAC) (sold separately) and provide a Bluetooth connection for your iPhone. 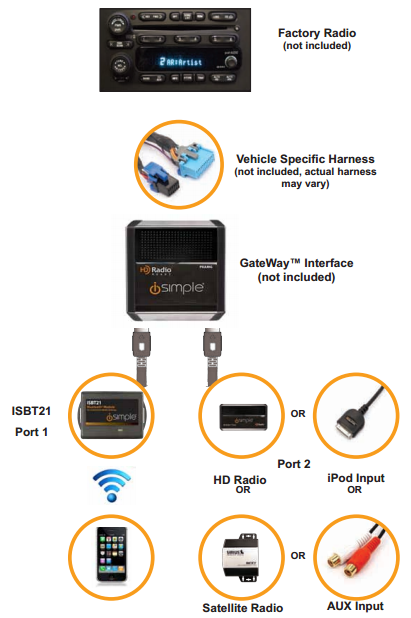 The ISBT21 enables you to connect your iPhone wirelessly to your factory audio system so your phone conversation plays through your automobile’s speakers. If you are looking the iSimple ISBT21 add-on Bluetooth Manual, here you can download in pdf format. 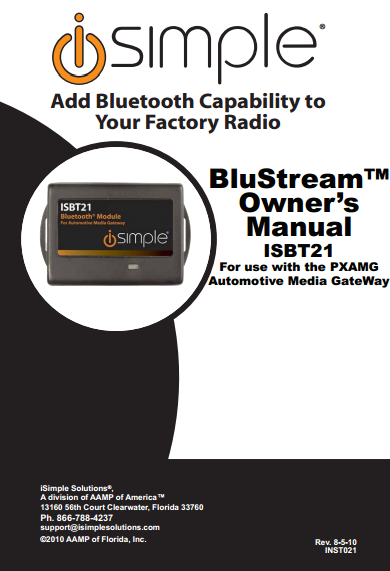 The iSimple ISBT21 add-on Bluetooth Owner's Manual provide detail reference information such as about installation guide, Pair Your Phone setting, features of the ISBT21, Streaming Audio Features, and more.